The exciting new flavors include Chocolate Cookie EnlightenMint, Mocha Fudge Brownie, P.B. Marshmallow Swirl, and Cherry Garcia With A Twist, an old flavor with a new, chocolate-y component. You can eat these dairylicious delights by the pint or try them in some Ben & Jerry’s recipes like Layered Smoothie Pops, the Caramel Cookie Sweet Potato Toast Topper, or my personal favorite, the Chocolate Milk & Cookies Ice Cream Bark – all containing the light, low-cal Moo-phoria! flavors. In addition to the newly introduced Moo-phoria! flavors, the company has three more 140-160 calorie light flavors listed on the website: Caramel Cookie Fix, Chocolate Milk & Cookies, and P.B. Dough. All the flavors are non-GMO, fair trade, made with cage-free eggs and organic milk and cream, packaged in responsibly-sourced containers, and certified Kosher. Plus, these Moo-phoric delights don’t contain any sugar alcohols or sugar substitutes. But now, more about the new flavors. Cherry Garcia with A Twist changes things up by mixing light chocolate ice cream with the light version of traditional cherry ice cream for an even sweeter pint of goodness. Chocolate Cookie EnlightenMint promises fudge truffles and chocolate cookies swirled into light mint ice cream. Mocha Fudge Brownie combines cold brew mocha light ice cream with fudge brownies and toasted marshmallow swirls for a sweet treat that may also get you a little wired. Finally, P.B. Marshmallow Swirl makes things nutty with peanut butter ice cream, peanut butter cookies, and marshmallow swirls. To make things sweeter, the Vermont-based company’s three-part mission statement prioritizes quality, sustainability, and justice, so you know that you’re supporting good values and causes when you buy a pint of Ben & Jerry’s ice cream. Issues the company cares about include racial justice, democracy, GMO labeling, fair trade, climate justice, LGBT equality, and corporate money in politics — you can read detailed stances on the company website and see what Ben & Jerry’s is doing to promote fairness and equality within their business. If the light Moo-licious! flavors aren’t for you, don’t forget that B&J’s has introduced several new flavors in 2018 that you need to get your hands on ASAP. 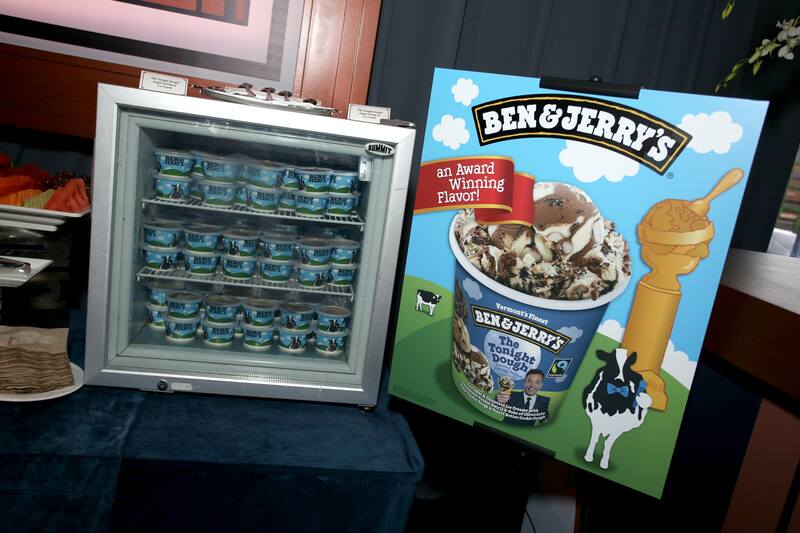 Ben & Jerry’s Pint Slices (which come in seven different flavors), the Ben & Jerry’s Truffles lineup (which includes a cheesecake, chocolate, and coffee flavor), and Ben & Jerry’s non-dairy pints, which include cinnamon, peanut butter, and coconut flavors (among others!) are the new products that the company released this year. So, whatever kind of ice cream you’re craving, be it light, vegan, chocolatey, or nutty, Ben & Jerry’s is sure to deliver and satisfy. Find all the flavors at your local grocery store or a B&J’s standalone ice cream shop.